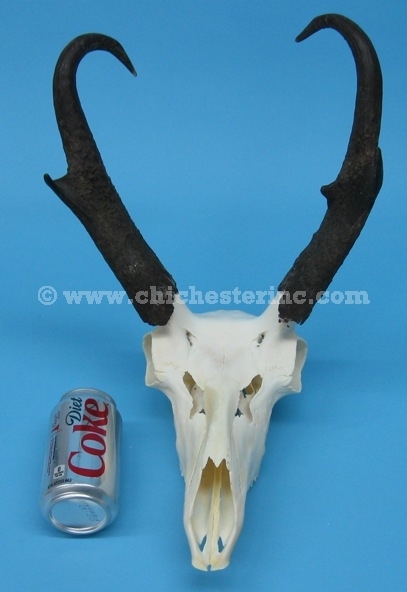 These are real pronghorn skulls with horns that have been cleaned. Pronghorn, also known as prong buck, pronghorn antelope, cabri, or antelope (though it is not an antelope) are indigenous to interior western and central North America. They have distinctive white fur on their rumps, sides, breasts, bellies, and across their throats and prominent, high-set eye sockets. They have distinctive branched horns with forward-pointing tine. Pronghorn are the fastest land mammals in the Western Hemisphere. Our Gxx codes denote individual pieces. 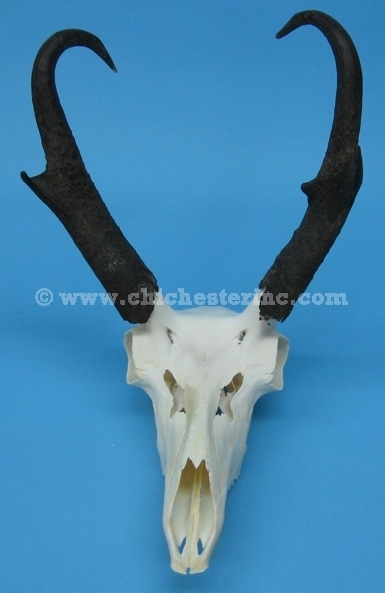 If you would like to order a specific pronghorn skull, please go to our Gallery to pick the exact one shown. Genus and species: Antilocapra americana. Wild. Pronghorn are not an endangered species. These antelope skulls are a by-product of the food industry. Not for export due to problems customers are liable to have importing horns into their country.